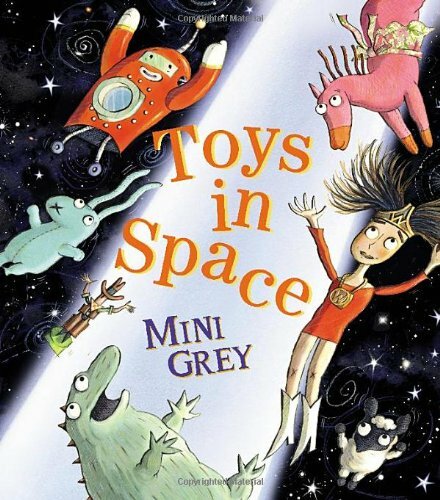 ‘That summer night for the first time the toys were left outside.’ This engaging opening sentence to Mini Grey’s latest picture book creates instant drama and a feeling of anxiety and tension. For the first time the toys experience the overwhelming immensity of the night sky and it is Blue Rabbit who sensibly suggests that a story is needed for comfort. Fortunately the Wonder Doll knows what is needed and she creates a space adventure in which the toys are beamed up to a spaceship inhabited by an alien who has lost its Cuddles. The toys are shocked to find that the alien has been collecting lost toys from gardens in its search. They must all be sent back! Eventually the Cuddles is discovered and safely beamed up to its owner. And back in the garden, the toys find dawn breaking as the story ends. The powerful theme of lost and found is delightfully and imaginatively played out in this playful story with its well drawn (in every sense) characters. The vitality of Grey’s expressive line and the tenderness of the relationships between this band of disparate toys will appeal to young readers on many levels. ‘Will there be a happy ending?’ asks the Dinosaur. ‘I do hope there will be a happy ending.’ And so too does the reader.